For today's post I want to explore some interesting facts about classical mechanics. But why should we care about classical mechanics if nature is quantum at core? One misconception I used to have was that we should care only about the emergence of classical physics out of quantum mechanics. I was not alone in this misconception, the late Sidney Coleman supported this point of view in his outstanding talk: Quantum Mechanics in your face. But as it turns out rigorous deformation quantization starting from a Poisson manifold can help arrive at the standard formalism of quantum mechanics. And to achieve that we need to understand the mathematical structures involved in classical mechanics: cotangent bundles, symplectic manifolds, Poisson manifolds. Because I did not write the needed mathematical posts for symplectic geometry I will keep the discussion at high level. A manifold with a closed nondegenerate differential 2-form \(\omega\) is called a symplectic manifold. Not all symplectic manifolds are cotangent bundles, but due to Darboux theorem a symplectic manifold is locally a cotangent bundle. In a symplectic manifold a polarization is a Lagrangian foliation (in the tangent bundle the foliation is the map \((q, p) \rightarrow q\); picture a foliation as a slicing of the space). Existence of polarizations is essential for proving the equivalence of a symplectic manifold with a cotangent bundle when true. Moreover polarizations are key ingredients in geometric quantization. The details are much more complex but this is the 10,000 feet view. The generalization from symplectic to Poisson manifolds happen when \(\omega\) can be degenerate. Non-degeneracy demands that the dimension of a symplectic manifold to be even, but Poisson manifolds can have odd dimensions. So how does the Poisson bracket look on a Poisson manifold? and again by Darboux theorem for any Poisson manifold there are local coordinates for which the Poisson bracket takes the usual form for the even subset of coordinates for which the rank is locally constant. In other words, a Poisson manifold can be decomposed into a product of a symplectic manifold and a Poisson manifold of rank zero. But how do we get the crazy Poisson bracket from above? The answer is symplectic reduction. I did not built the mathematical pre-requisites of moment maps to explain in an intuitive way how this works, and this will have to wait for future posts. In the meantime I can state some conclusions. First, category arguments can reconstruct both classical and quantum mechanics. In the classical case those arguments offer no help in proving the existence and non-degeneracy of \(\omega\). All we get from category arguments are Poisson manifolds! So it is imperative to prove that one can use deformation quantization on any Poisson manifold to arrive at quantum mechanics. Fortunatelly such a proof exists and was found by Maxim Kontsevich in 1997: http://arxiv.org/pdf/q-alg/9709040v1.pdf A remarkable fact is that the proof uses string theory insights!!! Second, the existence of time without invariance under composition is not enough to reconstruct either classical or quantum mechanics. The best counterexample comes from soliton theory and the Korteweg-de Vries equation. A KdV equation comes from a Poisson manifold without a symplectic analog, and moreover it is a bi-Hamiltonian system. KdV admits not one, but two Poisson brackets compatible with each other! 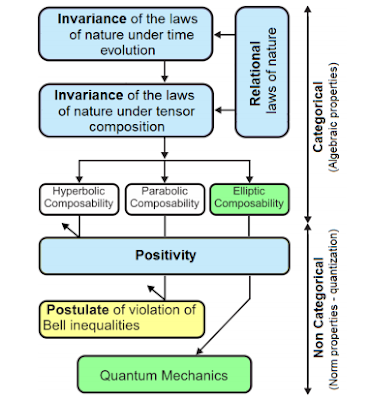 Third, not all quantum systems come from quantization of classical systems. Next time I'll start exploring topics of quantization. Please stay tuned.